Did You Lose a 65-Year-Old Golden Key to the City of Worcester in North Adams? 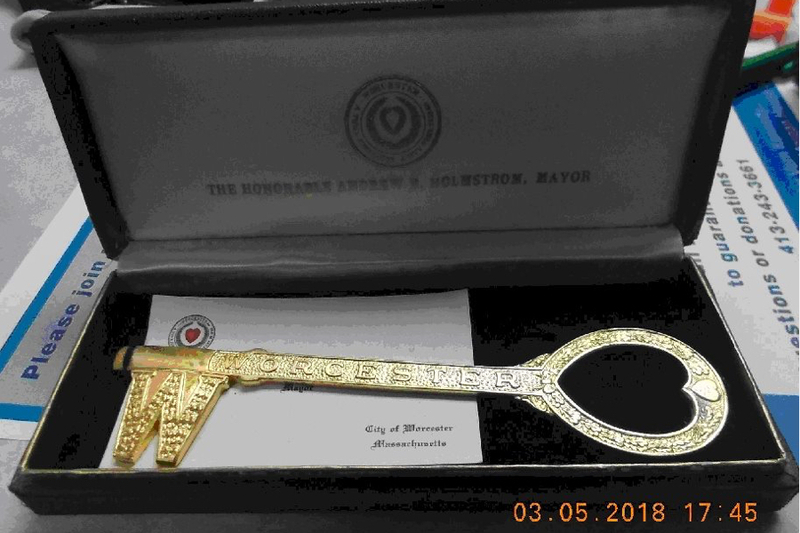 If you happened to lose a ceremonial golden key to the city of Worcester while strolling around North Adams this week, good news: It has been found. Police in North Adams say someone walking down State Street near a local watering hole called the Key West Lounge on Monday found a case containing an decorative six-inch-long key, which features a large “W” and a handle shaped like a heart. Written inside the case is an insignia for “The Honorable Mayor Andrew B. Holmstrom,” who was mayor of Worcester from 1950-1953, according to the Berkshire Eagle. Who owns the rare piece of Worcester memorabilia is anyone’s guess. Mayors have given away hundreds of keys to the city over the years, the Eagle reports, and there is no master list of records on who has received them. Key-bestowing is a Worcester tradition that began in the 1920’s and persists to present day. “Each time it is a carefully considered gift from the sitting mayor to a resident of Worcester or respected visitor, presented as a recognition of their contributions,” Worcester magazine reporter Tom Quinn wrote in 2015. Modern recipients, he says, include World War II veterans, people who turn 100, Barack Obama, Robert Kraft, and Neil DeGrasse Tyson. They come either in a case, like the one found in North Adams, or mounted on a plaque. And in case you’re wondering, they do not actually open anything (“unless the door leading to a lifetime of bragging rights has a lock on it,” writes Quinn). It’s also not exactly clear what the key’s value is. Some other ones have found their way on eBay, where two are currently listed for $100 and $113, respectively. So how did a 65-plus-year-old honor for public service to the City of Worcester end up randomly cast away in North Adams? Maybe we’re about to find out.